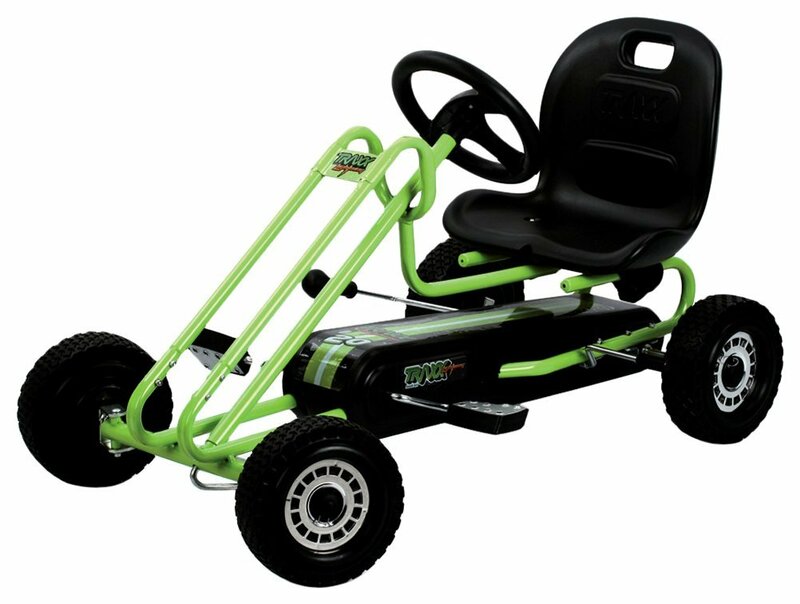 Pros: The tires of the Kiddi-O Aero Air Tire Pedal Car are air filled so they will last longer and control the kart better than the plastic wheels on other kids' karts. It rides well on almost any surface. Buyers will find that its "four bolt easy assembly" only takes half an hour or less to complete. 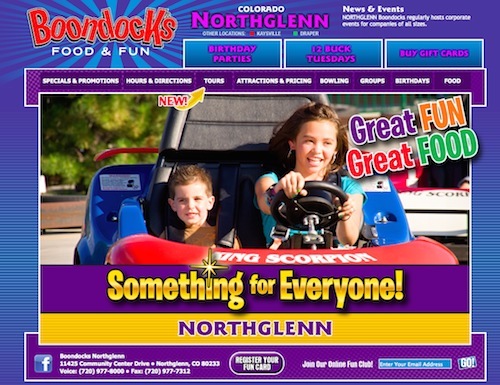 It accommodates a wide variety of kids across several ages. 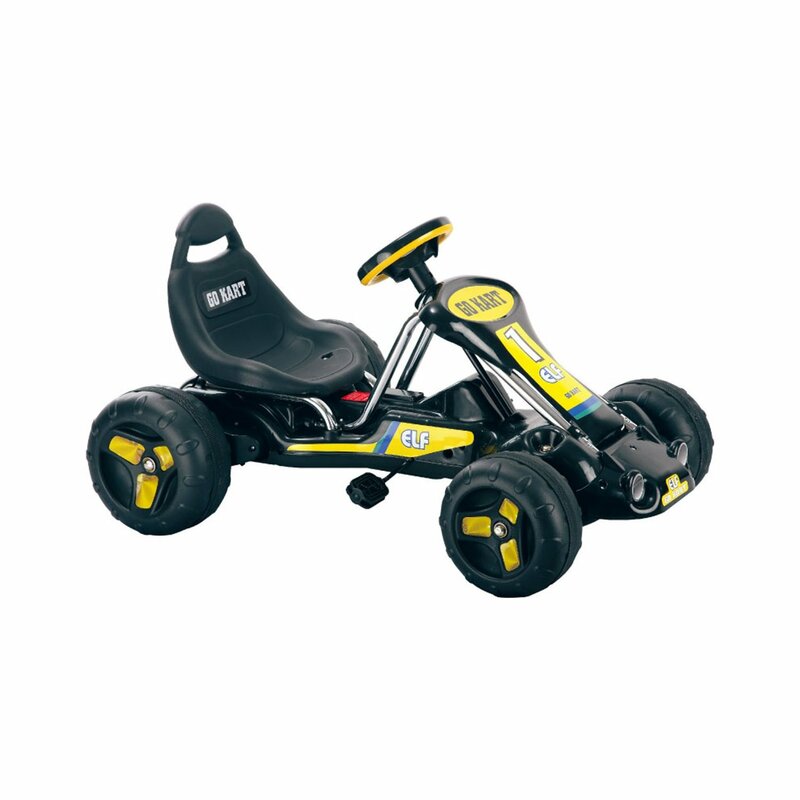 The instructions say that the kart is designed for kids between 5 and 9 years old but parents will testify that many kids younger than 5 have driven it without a problem. Cons: Some complain that the base length is too short so larger kids' toes can hit the tires and their knees can hit the steering wheel. A few have complained that the rear wheel bearing is prone to fail, the pedal chain can malfunction and that the rear axle house and shifter are weak. Others have been annoyed by the flimsiness of the shifter. A couple of customers say that the wheels are held on by a weak spring clamp and some have even reported that the wheels can fall off. Also few owners noted that the kart's steering shaft is made of soft metal so it can wear out. 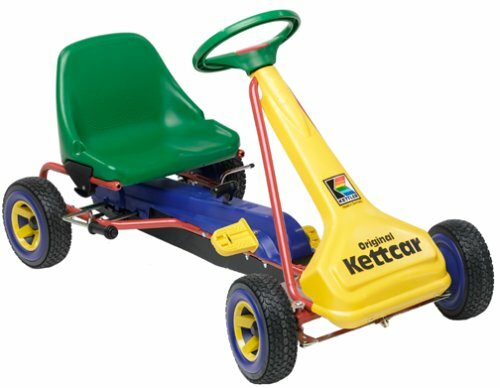 The Kiddi-O by Kettler Aero Air Tire Pedal Car is a stylish racing car for kids between the ages of 5 and 9. Its sleek design will attract kids of all ages and many parents report that kids younger than 5 and older than 9 have enjoyed driving the Kiddi-O. It’s large enough to fit most children and very easy to control. 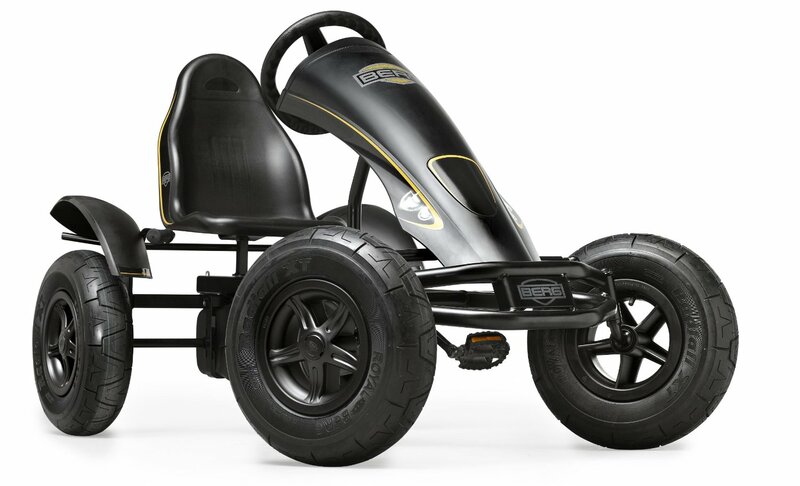 The kart is built with high quality parts that are designed to stand the test of time. It provides a stable, safe and fun way to enjoy a day outside. 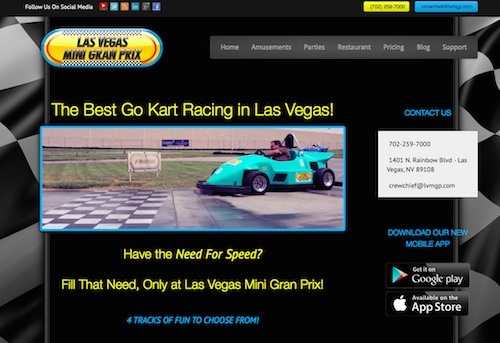 It is designed in the mold of a race car to appeal to kids’ desires for speed, style and the thrill of racing. Even though the Kiddi-O is built in the image of a race car, that doesn’t mean that it is unsafe. Kettler has taken many precautions to ensure the safety of the child driver as well as the Kiddi-O itself. There’s oversized non-slip pedals, an enclosed chain and a very low center of gravity to keep kids balanced and protected. It’s also constructed with a high quality steel frame, all-terrain style tires, a seat that is movable to 4 unique positions and there’s even pedal/coasting modes. 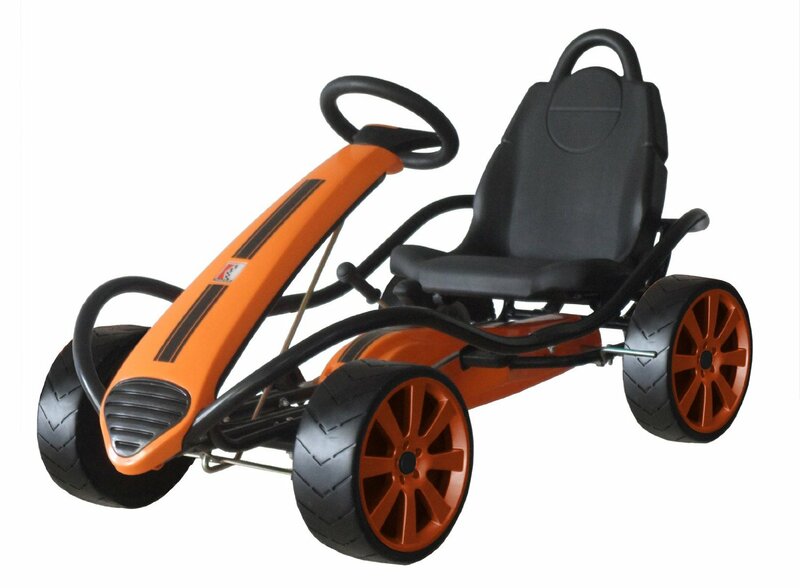 The kart’s tires are tubeless and filled with air so that they stay operable and grip the surface without any slips. 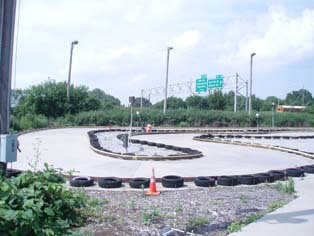 This is a stark contrast to competing kids’ karts that are built with shoddy plastic tires that can crack and slide all over riding surfaces. Kids can also choose between pedaling modes or coasting modes depending on their energy levels and the context of their drive. 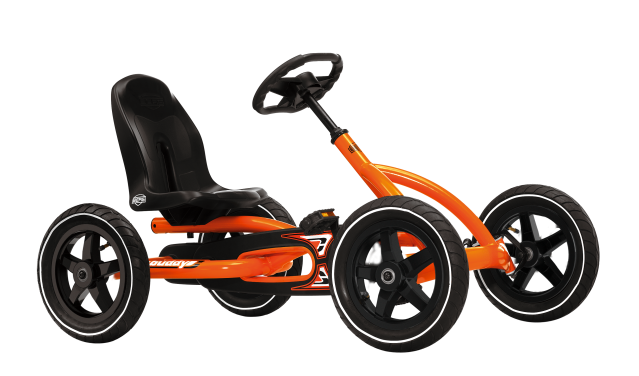 All you need to assemble the Kiddi-O Kettler Aero Air Tire Pedal Car by Kettler is a Philips head screwdriver, an adjustable wrench and pliers. It’ll take less than half an hour to put together and your youngster will be on his way for a joy ride around the yard or neighborhood. Colors Red with white trim and a black seat. Safety Features: Dual wheel rear safety hand brake system, non-skip pedals, tip proof and an enclosed chain. 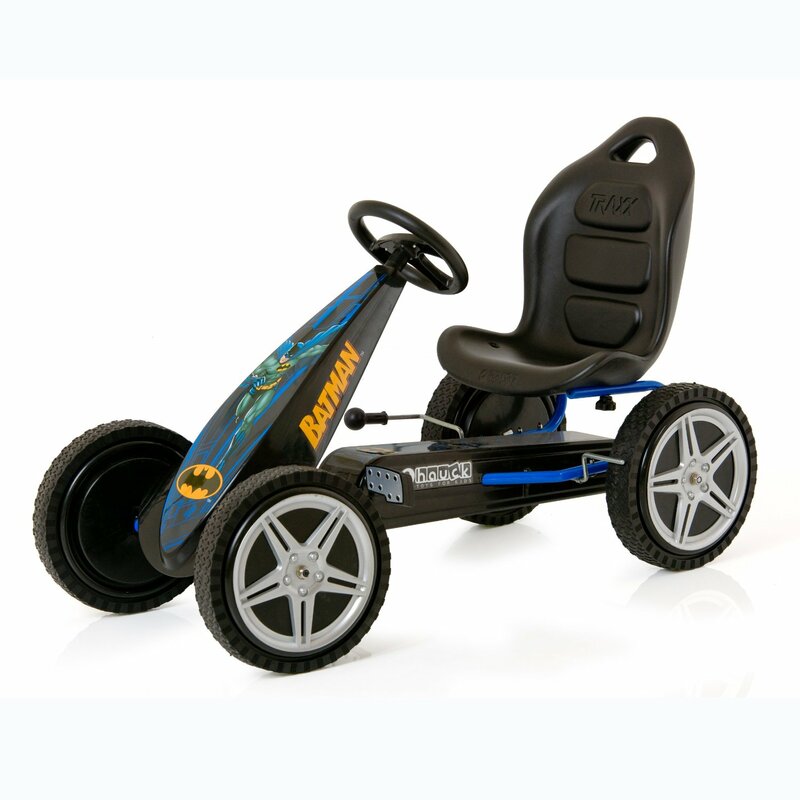 Features Sporty steering wheel, a high back racing seat that can be easily adjusted to 3 positions, a coasting lever, a high carbon steel frame with a special powder coat finish that is fade resistant and pneumatic tubeless air tires on sealed ball bearings.